It includes four books for the preparation of IIT–JAM, TIFR, GATE, IISc and JNU. Life Science, Fundamentals and Practice Part I and part II: Life Science, Fundamentals and Practice is available in two parts covering everything that one need to know to qualify IIT–JAM, CSIR-UGC-NET, DBT-JRF, ICMR, TIFR, GATE, IISc and JNU without overwhelming themselves with unnecessary information. It covers essential fundamentals and techniques that will improve one's comprehension and help them perform better in the examinations. Fundamentals and Techniques of Biophysics and Molecular Biology: This textbook has the primary goal to teach students about theoretical principles and applications of the key biophysical and molecular methods used in biochemistry and molecular biology. 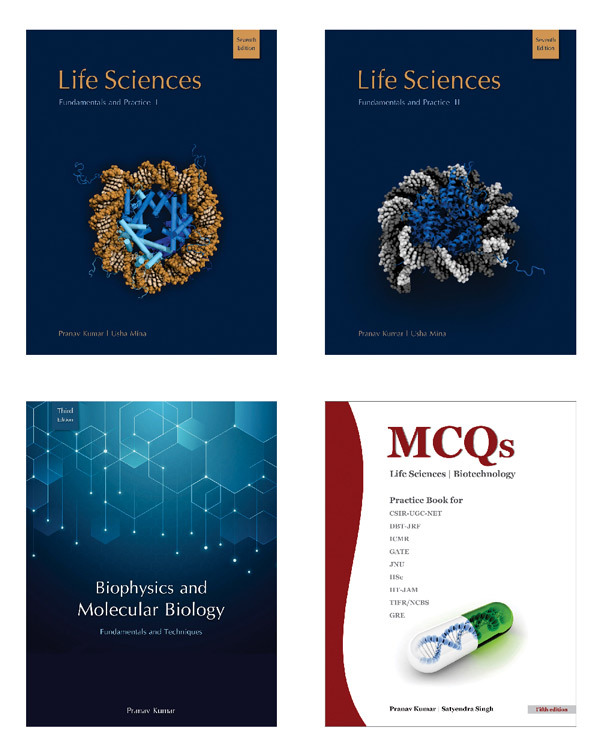 MCQs, Life Sciences and Biotechnology: This book is an exclusive fundamentals search based package of multiple choice questions, are basically designed for students to help them revise, consolidate and polish their knowledge and skills.